Home NEWS Matiba’s solemn plea to Kenyans ahead of Thursday’s poll. Matiba’s solemn plea to Kenyans ahead of Thursday’s poll. Jubilee Party leaders from Muranga, Kiambu and Mombasa Counties during a visit to Kenneth Matiba at his Diani Home. Kenneth Njindo Matiba, Kenya’s second liberation hero has called for peace as Kenyans exercise their democratic right to choose their leaders in the 26th October presidential repeat poll. 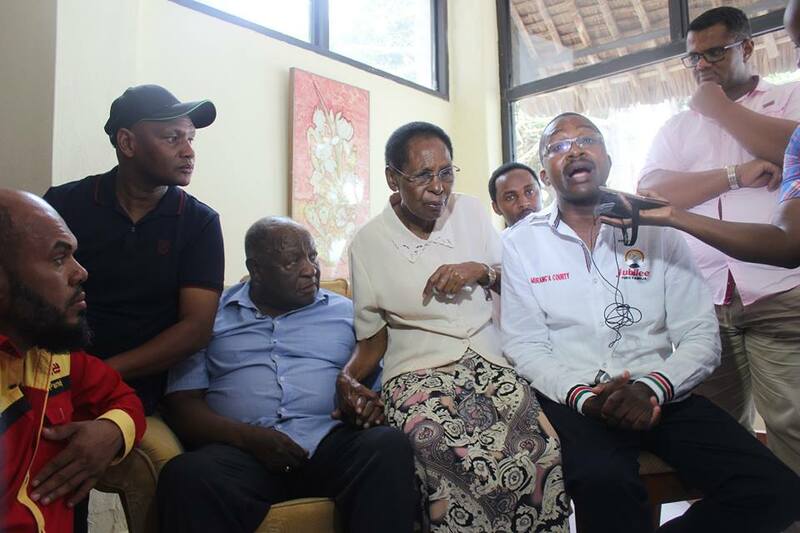 Speaking on his behalf at the Diani Beach home in Kwale County, his wife Edith Matiba asked Kenyans to pray for peace and wished this electioneering period comes to an end. “All we want is Peace, Peace and more Peace. I ask every Kenyan to go out and vote peacefully on the 26th (of October 2017) and maintain that peace even after the polls,” said Edith. Edith acknowledged the efforts made by President Uhuru Kenyatta in bringing this country together as he endeavoured to reach out to all the tribes of Kenya in an effort to have a unified and peaceful nation. She added that the Head of State had distributed resources and wealth to all parts of the country regardless of their political or religious affiliations. “I would like to point out that these endless politicking is really hurting us as Kenyans. We have seen Uhuru’s exemplary development record across the country and had it not for negative politicking, he would have performed even better. So, let’s us all pray that all this comes to an end and everyone gets back to work,” she said. She thanked the leaders from Mt. Kenya region for spreading the good news about the president to different parts of the country and wished them all the best in their mission to ‘sell’ President Uhuru to the people of Kwale County. While speaking at the same occasion, Murang’a Governor Mwangi Wa Iria asked Kenyans to practice political tolerance during and after the October poll. “Matiba told us to always let the people to decide on their own destiny. Let no one infringe on another person’s right to vote and choose the leaders they want,” said Wa Iria. He reckoned that it was wrong and illegal for the opposition to use threats so as to scare away people who wished to participate in the upcoming polls for their own selfish agenda. He appealed to all Kenyans to stick to where they had registered and exercise their right to vote for the government they wanted. Thika MP Eng. Patrick Wainaina said that it was very wrong for anyone to attempt to ascend to power by abusing the very freedoms that heroes like Kenneth Matiba sacrificed for, telling NASA leaders their approach to issues was misplaced and really jeopardising national cohesion and development. He requested them to practice constitutionalism and abide by its norms instead of polarising the country for political gain. “There is always a time for everything. We have politicked for more than one year now and NASA seems not ready to let Kenya be. It is time Kenyans said enough is enough and put to an end endless politics by deciding on their destiny on October 26,” said Wainaina. Wainaina asked all Kenyans to preach peace wherever they were and suggested that the proposed political dialogue to hold on until after the polls. He acknowledged Kenneth Matiba as an inspiration to his dream to serve the people diligently. Former Mombasa Senator Hassan Omar thanked the leaders from the Mt. Kenya region for putting the interest of all Kenyans ahead of themselves by preaching peace and unity among the coastal people. “I wish this gesture can be embraced by all and replicated across the country. Kenya needs to preach peace and unity regardless of our ethnic differences and backgrounds,” he said. He also acknowledged Matiba’s struggle to fight for the freedoms Kenyans currently enjoyed and asked them never to take certain privileges for granted. Other who spoke included former Ngewa Ward MCA Karungo Wa Thang’wa. In 1990, almost 30 years after Kenya’s independence, it had become clear that the ideals that drove our quest for independence were not only unmet, they had also been brutally betrayed and Kenya was marching backwards. Assassinations and disappearances were becoming normal. There was an assault on freedom of thought, information and association. Hundreds of Kenyans were being arrested or sacked because they expressed or were suspected to hold opinions that were at variance with those of the government. To simply put this into perspective, justice was being denied to Kenyans who were being hauled to jail on trumped up charges. This is the system that Kenyans in their anger and valour woke up on this day in 1990 and decided to face head-on. It began with Kenneth Matiba and Charles Rubia announcing that Kenya was ripe for multiparty politics. Matiba and Rubia never got to see the day. A few days later, police officers were deployed to arrest and detain both Matiba and Rubia. Then the crackdown began. Matiba was held without trial at the Kamiti Maximum Security Prison in 1990 with Charles Rubia, a member of the Kenyan Cabinet who also called for multiparty democracy. While in prison Matiba was refused medication and suffered a stroke, which affected half his body and incapacitated him for some time. Later, a multiparty system was instituted and Matiba was released. Since then, Matiba has been dogged by ill-health stemming from his 1990 imprisonment. His business holdings have also suffered.